Ground rods receive and carry the energizer's pulse from the soil back to the energizers. 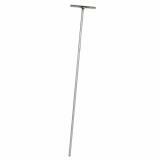 Heights: 3 ft or 18"
T shaped handle makes it easier to grip the rod when removing from soil. Allow 3 ft of ground rod per joule of energy output. 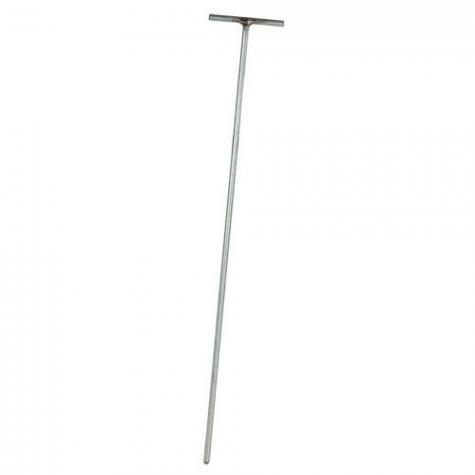 18" ground rods are to be used with energizers with outputs of 0.5 joules or less. In dry/sandy soil—use ground rods long enough to reach moist soil. Recommended: 8 out of 9 said they would recommend this product to a friend. These grounding rods are superior to the straight rods. Handles make removing the rods easy without the use of a jack or a tractor. Makes portability of the electric fencing really nice. Makes driving and pulling the rod a breeze! Such a simple tool made all the difference getting our fence working. 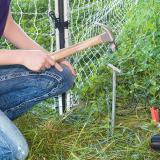 Rusty rebar wouldn't work, but this ground rod got our fence working properly with no problems! Easy to install and remove, definitely worth the money for the convenience in mobility! As long as the ground is soft these rods work like a charm but the T handle weld is too weak to handle driving into the hard ground with a hammer. Needs to be redesigned as a "cross" where the handle(s) is only used for pulling out of the ground and a flattened head spike above the handle is used to hammer into the ground. The weld broke on half of my ground rods and the T fell off.